The UI's Scottish Highlanders recall the glory days of pipes on the prairie. Still recovering from the despair and destitution of the Great Depression, these Iowa City teenagers knew what it meant to have next to nothing. So when Colonel George Dailey arrived with promises of bagpipes, fancy outfits, and tickets to faraway places, they could hardly believe their ears. One afternoon in 1936, City High School students crowded into study hall to hear Dailey make a most intriguing proposal. The University of Iowa's ROTC commander described his visit to Scotland's Edinburgh Castle, where he had watched a pipe band march down the hill, playing some of the most haunting music he'd ever heard. A centuries-old symbol of the Scottish military and nationalism, the bagpipe was once thought to create such a stirring effect on Scottish emotions that the English considered it an instrument of war. The sounds so captivated Dailey that he determined right then and there that he would form his own military bagpipe band-and he would do it in a most unexpected place. Such an ensemble would bring unusual color and culture to the UI, Dailey reasoned. It would benefit the membership of his ROTC unit, create a new university tradition, and it would be fun. In exchange for the students' ROTC commitment and pledge to learn the pipes, he would supply instruments, uniforms, and the opportunity to travel across the country. Young Richard Feddersen*, 41BA, was sold. Here was an enticing offer he could not refuse. "Dailey presented a very convincing idea that this was the thing to do, and that we would enjoy what we were doing," Feddersen recalls. "And that's how the Scottish Highlanders got started." 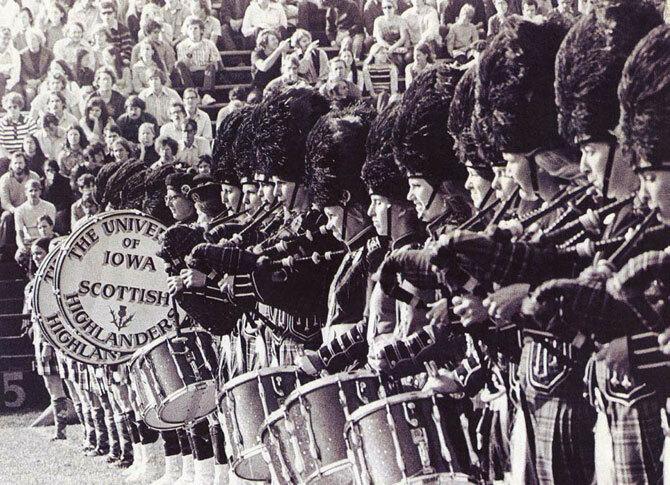 This September, the UI's Scottish Highlanders-once the largest and most expensively equipped bagpipe band in the world-will mark their long and decorated history with a special reunion and the unveiling of a permanent display at the Athletics Hall of Fame. But for the former members, this 75th anniversary is more than a time to celebrate and reflect. It's also a chance to spread the forgotten story of their international fame and legacy. At that first meeting at the old City High on Market Street, Dailey managed to recruit eight juniors, including Feddersen, to learn the bagpipes during their senior year before arriving at the UI. By the fall of 1937, Dailey had added more members to the ranks, as well as the best band director he could find: Pipe Major Bill Adamson, 62BA, a proficient piper since the age of nine, who had been leading pipe bands in Boston. Several photos courtesy of: F.W. Kent Collection of Photographs, University Archives, Department of Special Collections, University of Iowa Libraries The Highlanders' musical ability and charm won the world over. Here, the group poses in front of the UI's Old Capitol building. Below, Director Bill Adamson and his son, John, lead the Highlanders during a halftime performance in October 1948. "Highland Fling" atop a bass drum. Created by Adamson, this dance was unique to the Highlanders and eventually became known as the "Iowa Drum Dance." In addition to the piping, drumming, and dancing, the group also punctuated performances with fancy marching maneuvers and a cappella singing. The Highlanders also participated in parades, marches, exhibitions, festivals, and music contests across the U.S., where many audiences had never heard the bagpipes before. A highlight of those early years came in 1939 when the then 40-plus strong Highlanders journeyed to New York City to perform in the World's Fair, where wild cheers and appreciation greeted them. With the summer sun blaring down, the Scottish Highlanders-each wrapped in seven yards of kilt wool-marched on black asphalt in the 90-degree heat. "We'd play 'Scotland the Brave' and folks just went crazy," says Feddersen, a beam of pride shining across his face. "We stole the show-it was embarrassing." 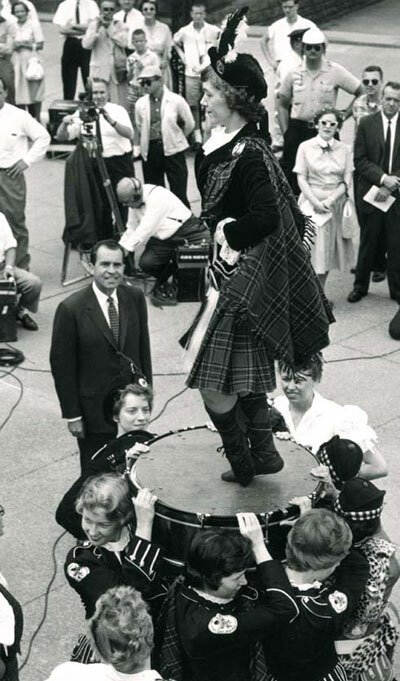 A dancer performs the "Highland Fling"—much to Richard Nixon's delight. With every passing year, the Highlanders grew in number and popularity at home and farther afield until World War II changed the group forever. By 1943, 71 of the 75 men had left Iowa to serve their country, including Feddersen. The original Highlanders were no more. This wasn't the end, though-it turned out to be only the beginning. Although his ranks were depleted, Adamson's resolve to continue was not. He turned to then UI-president Virgil Hancher, 18BA, 24JD, 64LLD [deceased], to see if he could open the Highlanders to women. In a note dated May 31, 1945, Hancher wrote: "Several days ago you asked me if there would be any objection to the recruiting of girls to play in the Highlanders band. There will be no objections to this, provided the recruiting does not take students away from their regular work in music." Hundreds of women expressed interest in the Highlanders, overwhelming the actual number of members needed. Adamson made his selections based on good musicianship, of course, but also on moral standards and conduct. The new Highlander would be the all-American girl who just happened to play a mean bagpipe. During the war years and beyond, these women reached new heights of success that garnered the Highlanders widespread fame. When the boys returned from war, there was no talk of giving back the kilts. As Feddersen says, "Anything we did was small potatoes compared to what those girls accomplished." The Highlanders remained affiliated with ROTC until 1955, when the group transferred within the university system to become a budgeted organization within the Iowa Memorial Union. Membership surged to the point that the Highlanders became known as the world's largest all-female bagpipe band. They traipsed the state, nation, and globe-completing seven world tours every four years from 1952 until 1976. During these two-month summer trips overseas, for which each girl paid her own way, the Highlanders visited England, Scotland, Germany, France, Austria, Italy, Switzerland, and the Netherlands. Everywhere they went, their talent drew deep respect and admiration from European crowds familiar with the culture and tradition of bagpipe music-made all the more impressive by the fact that Adamson maintained he never had an applicant with previous experience on the pipes. Because the bagpipe is not an especially easy instrument to master, Adamson divided the Highlanders into performance and training groups. New recruits spent their first year or so learning the complex coordination the pipes require-a simultaneous symphony of proper airflow, steady arm pressure, and fingers dancing along the keys. The Highlanders were so skilled that even skeptics were soon won over. Before a visit to Aberdeen, Scotland, on that first foreign trip in 1952, a civic leader criticized the Highlanders and described them as "comic characters who make a mockery of Scotland's national instrument and dress." But the group's flawless performance before a crowd of 23,000 people put the "Aberdeen incident" to rest. The Highlanders captured the hearts of the Scottish people, even the royals at Edinburgh Castle. While overseas, Highlanders stayed in the homes of locals to learn about each country, and their wholesome good citizenship erased any European stereotypes about the "typical American coed." The Highlander tradition of donating thousands of dollars in performance proceeds to British charities only magnified such feelings of goodwill and gratitude. Indeed, the women were some of America's best ambassadors to Europe. Heather Adamson Stockman, daughter of Bill Adamson and a dancer from 1964 to 1968, says this is the unknown legacy of the Scottish Highlanders. "We weren't just this squeaky band that toddled onto the football field and toddled off," says Stockman. "The Highlanders played a much more philanthropic role, and this is the story we want to tell." increase in bond sales by any major state that fiscal year. The department also honored the Highlanders for their outstanding patriotic service. At their peak in 1969, the Highlanders topped 110 members. They had traveled thousands of miles and performed before millions of people. They had marched in the Macy's Thanksgiving Day Parade, the Saint Patrick's Day Parade in Chicago, and both Hawkeye Rose Bowls (1957 and 1959). They had played at Disney World and made a return trip to the World's Fair in 1964. They appeared before television audiences on the Tonight Show and the Ed Sullivan Show. Their admirers included some of the most famed celebrities and politicians of the time-including John F. Kennedy, Robert Kennedy, Bob Hope, Ed Sullivan, Richard Nixon, Dwight Eisenhower, Johnny Carson, and Art Linkletter, all of whom added their autographs to one of the three bass drums the Highlanders used to collect important signatures. They had made memories to last a lifetime. "My four-year participation as a piper in the Scottish Highlanders was a highlight of my undergraduate days," wrote Penny Hall*, 65BA, 67MA, in reply to an article about the band in the UI's Spectator newsletter. Pam Klocksiem*, 68BS, added, "The Scottish Highlanders made such an impact on my life that 40 years later I'm still an active member of a competitive pipe band." In the 1960s, the Highlanders had reached the pinnacle of fame, but times were about to change. After a long battle with rheumatoid arthritis, Bill Adamson died in 1965, and another full-time director was never hired. Under the guidance of graduate student leaders and their own governing committee, the Highlanders continued with their European tours throughout the 1970s, even as they experienced less enthusiastic acceptance on the home front. The early part of the decade brought the equal rights movement, and the first postwar male rejoined the group in 1973- the same year that women were allowed to join the Hawkeye Marching Band. The Highlanders remained coed for the remainder of their twilight years at the UI. In 1981, the UI eliminated the Highlanders budget. For a few years, the group received funds from various organizations and businesses, but not enough to maintain previous endeavors. While they remained a student organization under the Office of Student Life, the Highlanders' long tradition of performing at Kinnick Stadium ended. In 1986, the Highlanders celebrated their 50th reunion and gathered for another reunion in 2004, when many alumni expressed concern over dwindling group participation. A Halloween parade in the fall of 2007 marked the Highlanders' last performance before officially disbanding in 2008. Join the Highlanders and see the world was Dailey's vow, and the promise was kept. During the height of their heyday, the Scottish Highlanders were a phenomenon found nowhere else. The men and women who brought a "wee bit o' heather to corn country" believed the tradition was important and worthwhile, and, along the way, they made lifelong friendships and enjoyed experiences that defined their college years. "I was in some fine army units during my tour of duty in the South Pacific," Feddersen says. "On a different scale, being part of the Highlanders was the same kind of feeling." Like the mournful lament of a distant bagpipe, the Scottish Highlanders' place in UI history now calls from the boxes, shelves, and exhibits in library archives and the Athletics Hall of Fame. There, the stories and photos of smiling lads and lassies memorialize the glory days of a bygone era, a time when the world stopped to listen.